This past week has been spent waiting out the weather in the Mackay Marina. Mind you it has still been relatively lovely weather - between rain squalls - but the wind has been blowing hard. As Captain G described it to someone on the phone the other day, "it would blow a dog off a chain!" 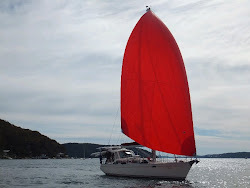 The notorious south-easterly wind has arrived in the tropics and clearly placed sailing way down on the "to do" list. The great news, however, is where we were originally here for one of the sailing club's rendezvous nights - a dinner meeting with other boats participating in the Coral Coast Cruise 2013 - the activities and camaraderie extended - due to the weather - over the many days and nights stuck in the marina. And we've had a great time! First there were welcome drinks as different people and boats arrived and then the original rendezvous dinner planned for this past Monday. The crews from 5 boats met in the marina pub before going on to a Thai dinner. The boats are: Nirvana's Kitchen, StressFree, Bogart, Whimaway and our boat Southern Belle. Leon, the skipper from Nirvana's Kitchen, has been our extraordinary events organiser. Before the dinner he negotiated a couple of free bottles of wine on arrival at the restaurant which kicked off the evening with a bang. Everyone at the pub before going on to dinner. Fantastic bunch of people! The following day we all pretty much went our own way with most of us taking a trip up to the Eungella National Park....once back at the marina we all met for a catch up in the pub where Leon had planned two excursions for us over the next couple of days. Our first adventure was a tour of a sugar cane mill. I mentioned in my last post about the miles and miles of sugar cane growing here so a trip to a mill - which none of us had done before - sounded like a good idea. Arriving at the mill down more roads thick with flowering cane we waited in the "instruction" room for our briefing on what we would do and see and then donned our regulatory hard hat, earplugs, safety vest and glasses for the walk through the noisy mill. Signing in for the tour and getting ready for our briefing. The tour was very interesting....and loud. The mill we toured was built in the 1800's and looked like it too in some places. I think we were all fascinated with the process of rolling in the cane via the purpose built railway, pulverising it, boiling it and then turning it into crystals. Once the sugar is milled and crystallised its sent to different places to be washed and made ready for market. Good tour, really interesting and fun. Inside the mill with our tour guide. At the end of the tour you pass by the dumpsters with lots of spilled sugar and sugar by products. These rainbow lorikeets were everywhere. The tour guide said they get "drunk" on the sugar. There were at least 50 or more in the rafters and squabbling around all the sugar piles. The next night's activity was lawn bowls! Leon organised not only an evening of bowls but dinner and a bus to take us there and back. Bargain! I think we all expected a small rather run down club on arrival but the club was huge with two courts completely covered and enclosed ... well sort of enclosed, the wind still whipped in from the far side. If you've never played lawn bowls you probably think - like me - that it would be easy. Simple really, just roll the ball down a field in a straight line and hit the target ball. Right? Wrong. It's bloody hard. Our group with our "instructor" as we try to figure out how to play the game. Our group at the table for dinner after bowling. Today is Saturday....and the week's over with everyone happy with the friendship and activities but more than ready to get on with the trip - the RPAYC group and the boat, Momentum, left Mackay this morning for various islands in the Whitsunday Island group. Southern Belle, Bogart and Nirvana's Kitchen are now anchored in a lovely little bay off Brampton Island tonight. Tomorrow we're all planning to do the 8km walk in the Island's national park. I think you'll agree so far so very good! An 'arboraceous' change of pace.